One of the elite Line One sires in the nation today. Top selling bull in Cooper Herefords 2009 Sale at $55,000. His first set of calves proved his outstanding breeding status by making him 7 star performance sire. His sons are the ranchers kind with extra performance and sound made. His daughters are extremely feminine and angular. We also used him on heifers with no problems. 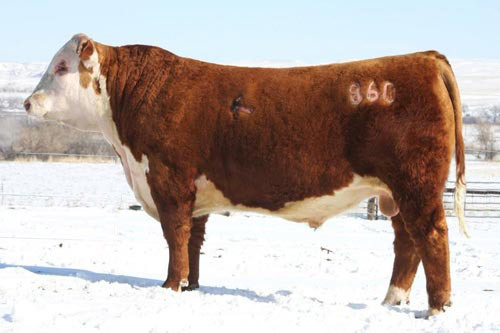 860U's dam, “5142R”, is a short-marked, moderately-framed “1172L” daughter with 100% eye pigment. She ranks in the top 1% of the breed in Milk(+30), YW(+106) and M&G(+53). Top 5% of breed in WW(+55), Milk(+26), Scrotal, and CHB Index. 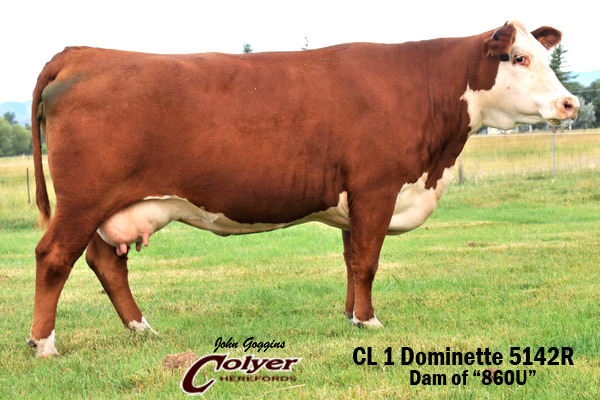 An elite dam at Cooper Herefords.